Rugby player and OCCC student Roman Wilson, 20, (left, with the ball) is one of the youngest athletes to play his way onto a team that will compete in the Maccabiah Olympics in July in Israel. Rugby player and OCCC student Roman Wilson, 20, is one of the youngest athletes to play his way onto a team that will compete in the Maccabiah Olympics this July in Israel. The team is comprised of athletes that have been hand picked from all over the country. Wilson said his father helped start the University of Oklahoma rugby team in 1975. 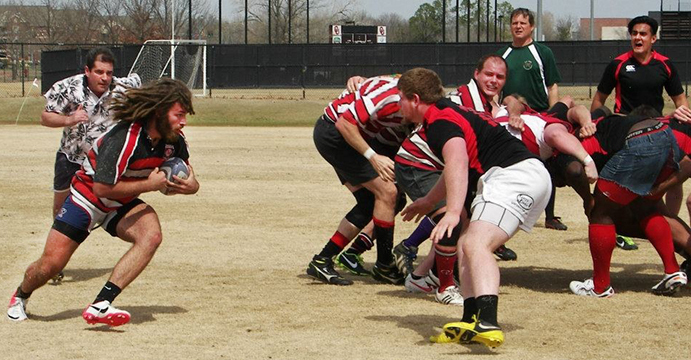 Roman Wilson said he began playing rugby his sophomore year at Norman High School. In August of 2012 he tried out for the Maccabiah team. A graduate of Norman High School, Wilson currently attends OCCC and spends a majority of his time training for the Maccabiah Games. Because the Olympic team is made up of athletes from across the U.S., he sends in weekly reports informing his coaches of his progress. Wilson also has spent time at the Olympic Training Center in Southern California where his team spent a day training with U.S. Navy Seals on Coronado Island. Their training included rope climbing, relays and carrying 300-pound logs. Not only do the athletes have to prepare physically but also mentally. “Visualization is a critical component of high-level performance in any sport,” Lipman said. He compared the competition to war. “In the heart of battle, you have already been through it many times in your head, and are able to be intuitive in performing,” Lipman said. While Wilson has played many other sports, including wrestling and football, he said rugby is his favorite. There are similarities between rugby and football; however, rugby is often considered a hooligan’s version of the popular American sport. The Maccabiah Games, often referred to as the Jewish Olympics, will host 40 sporting events with more than 7,000 athletes from 75 countries. Wilson will travel to Israel along with his teammates and take part in the Rugby Sevens tournament as well as the Rugby Fifteens tournament. Sevens and Fifteens refer to the number of players on each team as well as the length of each game. The U.S. team will face opponents from countries such as Israel, South Africa, Chile and a few others. Wilson and his teammates will be arriving in Israel during a time of continued political unrest, which Wilson admits he is slightly anxious about. Lipman is less concerned. According to the official website for the Maccabiah Games, the games were established in 1932 by a young boy who viewed the 1912 Stockholm Olympic Games and wished to achieve something just as great. The Maccabiah games take place every four years in Israel. The opening ceremony will be held in Jerusalem on July 18 at Teddy Stadium with an expected audience of more than 30,000 people in attendance. The closing ceremony will take place in Haifa on July 30 at the new Ofer Stadium. The events also will be televised via satellite on BBC America.